I was a kid during the Vietnam War. I remember the nightly television scenes of boys not much older than I was, crawling through rice paddies while explosions ignited around them. Some of the young men were relatives, others were neighbours. 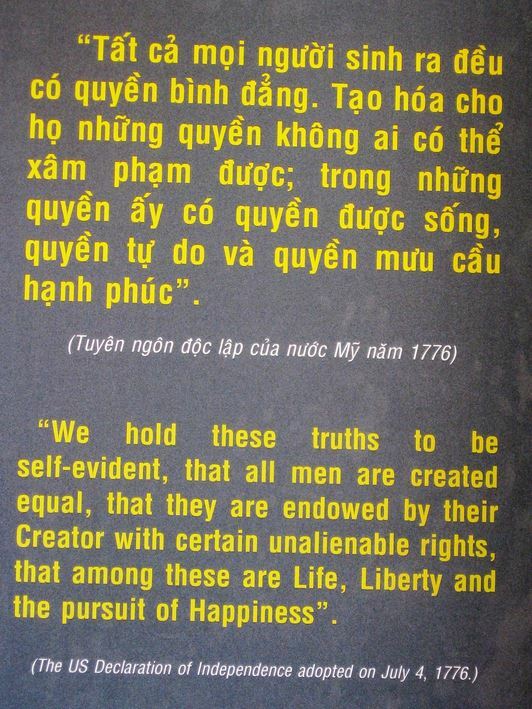 A few years ago, I was in Vietnam and reflected again on the war which the Vietnamese call the American War. For the youthful people whom I met, it was their grandfather’s war. 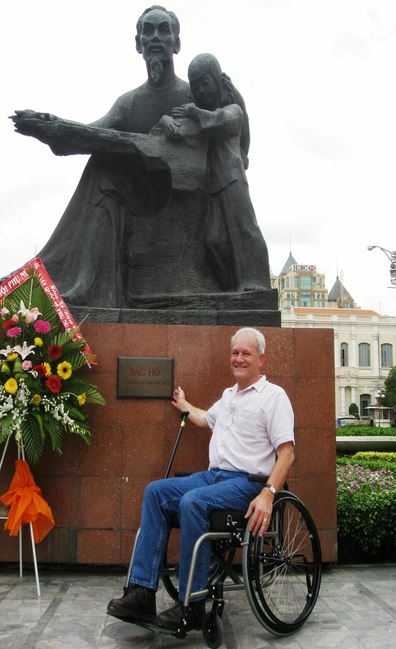 I was a gray-haired North American on the streets of Saigon (Ho Chi Minh City) in a wheelchair and was often mistaken for one of the many American veterans who now come to meet ghosts of their past and to pay tribute to their fallen comrades. The Vietnamese were enthusiastic in their remarkable kindness towards me, other visitors, and the infrequent American war vets. Bác Hồ (Uncle Ho) says the plaque to my right. Bác is a title of great respect in Vietnam, which honours Ho Chi Minh as the father of the country’s independence from French colonial rule. After America’s grueling 8 years of war in southeast Asia, few would have expected the warm reception which Americans now receive in the country (which still reveres Ho Chi Minh and still waves the same communist star from flag poles everywhere). In Saigon, my only anxious moment happened when I was alone, crossing a busy street. I was in my wheelchair and had almost made it to the opposite curb when the light changed. Unfortunately, the opposing sidewalk which I had reached was about ten inches higher than the street and there was no ramp. I couldn’t get up to it, and I was in danger of being flattened by several hundred on-coming vehicles. In a flash, two rough-looking young Vietnamese men hopped down from the sidewalk and lifted me and my chair to safety. During my stay, which was partly a business trip, I sailed on Vietnam’s Halong Bay, within the Gulf of Tonkin, in northern Vietnam. I wanted to see the amazing limestone islands that poke through the water like gray and leafy-green bowling pins. In the ancient past, reefs built upon reefs upwards a thousand metres while the sea deepened, then a karst erosion and tectonic uplift created today’s eerie landscape. On the sea, between islands with cliffs, cays, and caves, are floating villages of fishermen while deep below are fields of oil. 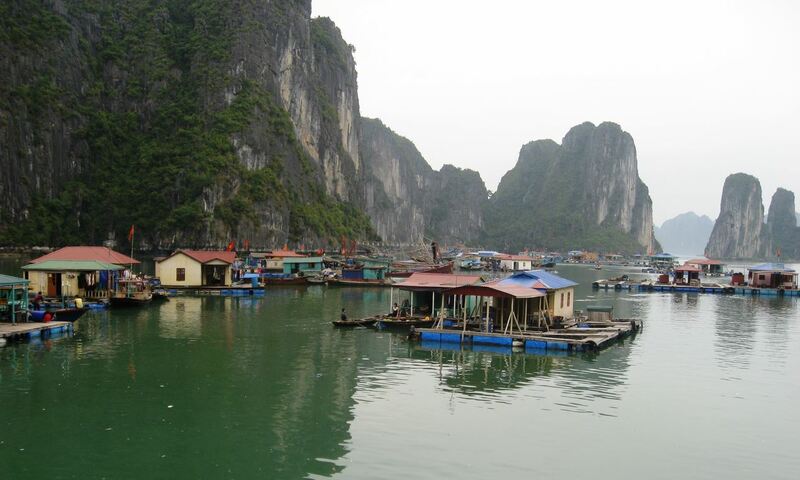 Reaching Halong Bay is a small adventure – it’s 120 kilometres from Hanoi. This took 4 hours by minivan – we met thousands of bicycles, heavy trucks, buses, and a single train whose track intersected the QL-18 Highway again and again, giving us a chance to wave at the same engineer each time his locomotive blocked our path. At the gulf, it was physically challenging for me to clamber down the steep concrete steps to the gangplank, then clamber aboard the craft. (I can walk a bit, but usually need a wheelchair to get around.) It was worth the challenge. After a lady on a heavily-laden boat sold bananas and pineapples to our captain, we drifted further from the shore, then roamed the islands along the coast for six hours. I was there for the geology. I didn’t expect a lesson in politics. Aboard our boat were twenty tourists. Most, like me, were from far away – Singapore, Holland, the USA, Finland, Canada. Other tourists were Vietnamese. As our small craft plied between the islands – looping to Cat Ba, Sung Sot Cave, and back to Halong, everyone mingled and chatted. English was the common language. I had spent a few months studying Vietnamese before leaving Canada – I was, of course, relieved that English was the language of discourse. My innocent remark unleashed a short-lived but energetic discussion about the South China Sea and the control of its petroleum. The remote marine oilfields had the attention of both countries. To me, Vietnam has the stronger case. China is far from the petroleum and the hotly-contested cluster of reefs and islands, but China has claimed groups of islands on what they say is an historical basis. “Our ancestors used to fish the entire South China Sea,” says Sheng Ding Li, a spokesman at Shanghai’s Fudan University. Possession of the seas depends on historic use, but in international law, occupation and presence is a big part of ownership. Distances out here are much larger than you might expect. 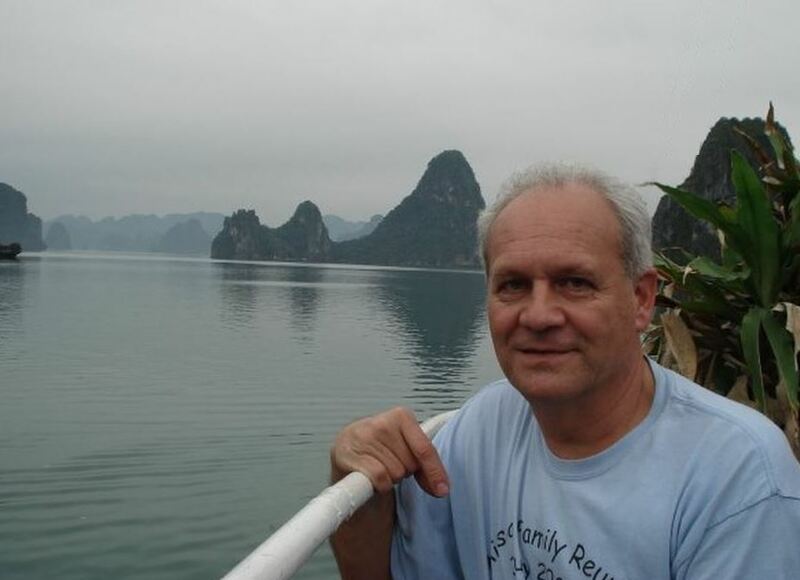 For example, my 2-hour flight from Saigon had taken me 1,200 kilometres north to Hanoi. This is greater than the distance from Italy to Sweden, yet I was still in Vietnam. It would have been half as far to fly out to the garrison guarding the contested Vietnamese islands in Trường Sa, also known as the Spratly Islands. Mainland China is about 2,000 kilometres from the Spratlys. The Spratly Islands are one of several island groups that figure large in any discussion of sovereignty and oil in the South China Sea. 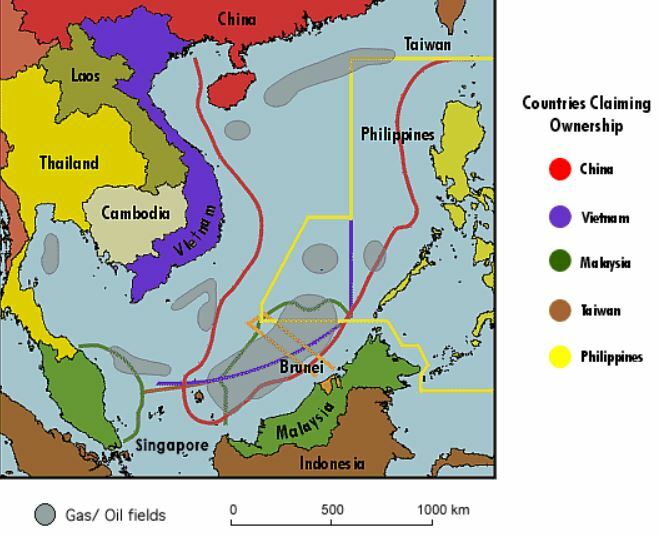 Parts of the South China Sea are claimed with equal passion by China, Vietnam, Malaysia, Japan, the Philippines, Indonesia, and the Sultanate of Brunei. The Philippines claims eight islands in the Spratlys while Malaysia claims three. Vietnam, Taiwan, and China each claims all the islands of the Spratlys and the Paracels farther north, as well as nearly all of the South China Sea. Although international economic zones are limited to 200 kilometres (120 miles) from a country’s coast, possession of distant islands can expand the amount of ocean waters claimed one hundred fold. No one knows how much oil may lie beneath the waters here. The South China Sea reaches a depth of over 5,000 metres where the seafloor is basaltic ocean crust and petroleum is absent. But that patch of tough ocean crust – all of it at least 3,000 metres below the waves – is a relatively small part of the South China Sea. Surrounding the oceanic crust is a larger region of shallow (200 metres) continental shelf. The ring of continental shelf has a lot of oil and gas, much of it within reefs similar to what I saw exposed in Halong. The Halong reefs are limestone islands; the oil-rich reefs to the south are below the sea, buried in reservoirs deep within the continental shelf. I worked with some of the seismic data from Petrovietnam. The pools that have been built by tectonically shifted crustal blocks are messy for geophysicists to figure out, but there are plenty of oil-soaked structural traps in the South China Sea. Some of the pools of oil are hundreds of metres thick. The disputed South China Sea has cautiously estimated reserves of 7 billion barrels of oil and an incredible 900 trillion cubic feet of natural gas. There is likely much more awaiting discovery – China has announced they expect the total recovered South China Sea oil will be 130 billion barrels. That may be an overstatement. But maybe not. Countries have gone to war for much less. Not long ago, state-owned China National Offshore Oil Corporation placed rig HYSY-981 within disputed waters close to Vietnam. This caused anti-China riots in Vietnam and led to 21 deaths among Chinese, many of whom were citizens of Vietnam who had been living in the country for decades. To protect the oil rig near the Viet mainland, the Chinese government surrounded their platform with 112 military vessels. Vietnamese fishing boats that got too close were hit with water cannons, boarded, and fisherman were detained for weeks. Having proved their power – if not the well’s success – the Chinese national oil company removed the drilling platform and its Navy withdrew. For the moment. Besides pressing oil rigs into waters claimed by other countries, China has also engaged in island-building exercises. This is a crafty way to expand territorial claims. 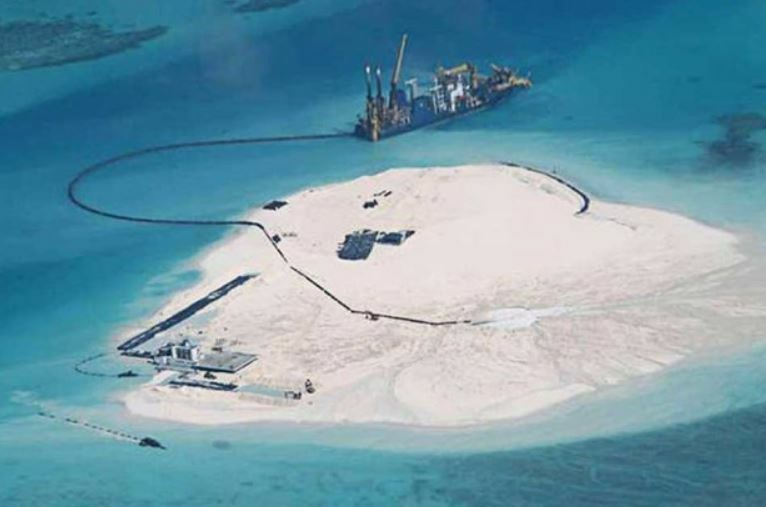 China is pumping millions of tonnes of reef debris atop slightly submerged atolls, raising little knobs of drowned land high enough to permanently post soldiers and Chinese flags. Such manufactured islands are also buttressing lighthouses, artillery, and airstrips. The Paracel Islands – reefs and atolls that have a slightly higher elevation – were grabbed by China during a brief aggressive war against Vietnam in 1974. Vietnam, exhausted by the American War which had ended just a few months earlier, was no match. China’s claim to the Paracels has not been generally recognized, but in July 2012, China established the “city” of Sansha in the Paracel Islands when it plopped a thousand people into the city. Again, under international law, occupation and presence is a big part of possession. The Vietnamese military can not stop China’s sand pumps, island occupation, or its battle ships on the seas. The Chinese navy is perhaps a hundred times larger. China’s economy is 40 times larger than Vietnam’s. China has 1.4 billion people, Vietnam has 90 million. Vietnam’s response has been mostly diplomatic, and mostly ineffective. Like the Chinese, the Vietnamese established garrisons on several remote islands. 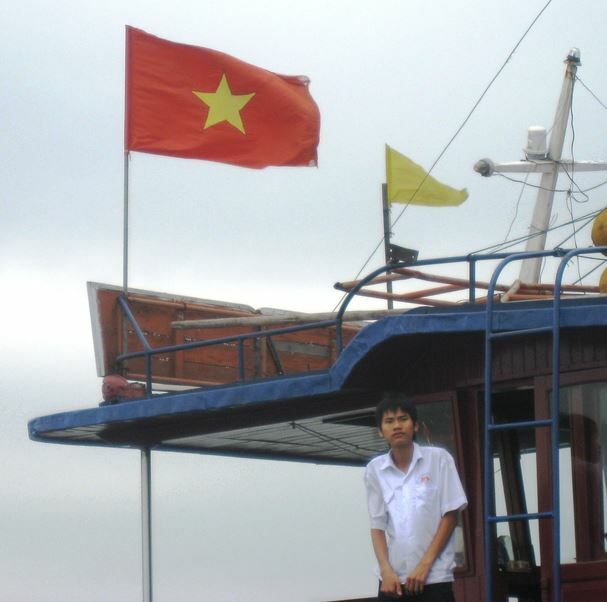 In a novel attempt to assert ownership, one can board a holiday cruise in Saigon and sail out to the Spratly Islands as a signal of solidarity with the Vietnamese. I can hardly imagine a less interesting cruise, unless your tour boat is hit by Chinese water cannons or you are arrested and held by the Chinese for trespassing. Tour-stops include Nam Yết, one of the larger of the Spratlys. There is not much to see. Nam Yết is less than a kilometre long, and not quite 120 metres wide. On this speck are a couple hundred soldiers, some vegetable gardens, paved footpaths and palm trees. This I observed from Google Earth, which is about as close as I will get to walking on a Spratly. China’s oleaginous rig stunts, island-building, and aggressive cannon flexing has aroused the attention of regional neighbours (Japan, the Philippines, Malaysia) as well as powerful potential allies such as Russia and the United States. Russians and Americans have entered on the side of Vietnam and other states which are growing nervous about China’s aggressive expansion. Russia has defense treaties with Vietnam – the Russian navy is the only one in the world allowed to enter Vietnamese ports without prior permission. (Other nations are allowed one unannounced visit per year, though that will likely increase.) The entire issue melts down to an international effort to curb China’s claims to ninety percent of the South China Sea. A successful claim by China would interfere with maritime freighters. About a third of the world’s trade passes through the sea. There is also the issue of oil, of course. Vietnam has reached out to the USA, seeking help in its defense. The Americans insist that the USA is not a claimant in the disputes, but instead is concerned about the militarization of the South China Sea. Americans surveillance planes have spotted Chinese artillery on disputed islands. The irate Chinese responded by ordering American planes to quit spying and leave the area. They even issued a statement that if Americans continue to provoke them, war would be “inevitable”. Visiting Hanoi, American Defense Secretary Ashton Carter said that the USA “will not be intimidated” by China. It would be terribly ironic if the United States should fight alongside Russia to defend Vietnam’s sovereignty. The Vietnamese consider the American War a war of independence against colonial rule. At the War Remnants Museum in Saigon (Ho Chi Minh City), I took this photograph of a prominently displayed sign. It is the first paragraph of the American Declaration of Independence – something which I memorized as a Pennsylvania school child, and which I still recall verbatim, as do many people who were educated in the USA. It may be that Americans – motivated by China’s expansion and the existence of petroleum reserves – will again be involved in Vietnam’s independence. 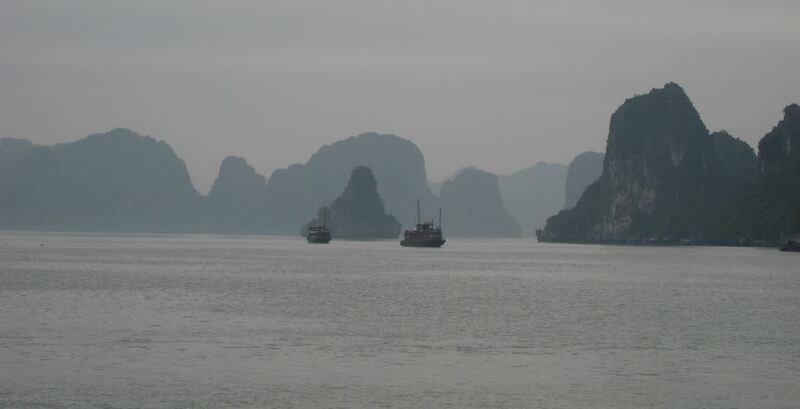 This entry was posted in Culture, Exploration and tagged China, Ha Long, oil industry, South China Sea, Vietnam. Bookmark the permalink. As they say, the enemy of my enemy is my friend. But that can be temporary, of course. No way the US will do anything to seriously annoy China when it is China that underwrites the US currency.